Any Bryan Davis books that pop up on my radar are always coveted reads, and Song of the Ovulum isn’t an exception. The author’s style of writing is exactly up my alley and I generally finish his books in under a day, because I’m so completely hooked on the story.Unfortunately, as with all of Davis’ later books, there’s many conflicts with the Bible that give me severe reservations about the book. 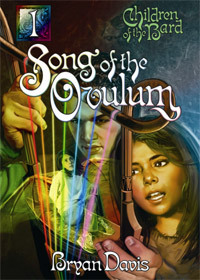 With the conclusion of the Oracles of Fire series, many fans of Davis, and even Bryan Davis himself thought that the story begun with Dragons in our Midst had finally reached a conclusion. Billy and Bonnie were wed, and Second Eden had been saved. But the story picks up again with The Song of the Ovulum. Fifteen years have passed, and the United Nations has grown hostile towards dragon and anthrozils, or half-dragons. Billy and Bonnie’s twin children have been torn from them, and they themselves have been thrown into a maximum-security prison. This premise opens up the third series in the story, this time focusing mainly on Bill and Bonnie’s two children, who by now are sixteen (Obviously, as Davis prefers writing teens; this becomes apparent in this book). It’s an exciting story. Davis really is an amazing storyteller, as this book evidences. The books would be infinitely better, though, if Davis stayed out of the Bible. His earlier two series should have alerted you to the fact that in the third series, nothing has changed. Characters hover between Second Eden and the ‘real’ Earth, and once again an invasion of Heaven is under way. Davis tosses around various dimensions like Hell and Earth, and a few extra-Biblical places such as Second Eden. His mixing with Biblical characters is even more suspect. Continuing from the Oracles of Fire series, the characters of Noah’s Ark are tampered with, and in the case of this book, the adulteress whom Jesus did not condemn is given a face and a story. Enoch is a character in the book, as are Nephilim and several other Biblical characters. In short, Davis feels that it is all right to add to what the Bible has written to create a good story. It’s really a shame, because he does it so well. I wish he could write equally good books without dragging God’s Word into things. Unfortunately, the writing in this book is of a slightly lower caliber than the previous books. This time around, Davis proves that his strength is teenagers. Billy, Bonnie, Ashley, Walter, Gabriel, Elam, Sapphira, and the other characters of the previous series are all grown, and they speak as if they’re still teenagers. Literarily, their voice has not changed at all. It made their adult personas seem out of whack and strange. By contrast, Davis’ new teen characters, Matt, Lauren, Joran, and Selah, all fit the bill quite well. It’s a niggling annoyance in an otherwise extremely well-written book. Overall, I can’t recommend or not recommend this book either way. In a writing way, the book is almost as excellent as Davis’ previous books. The Biblical issues are for you personally to decide before you read the book. It does stand alone, but you’ll probably want to read the previous two series before this, which have their own set of Biblical issues. My one admonishment is to double and triple-check everything against the Bible. Sure, Davis’ tweaking makes a great story, but ultimately it’s not inspired truth from the mouth of God. So be wary with this book; use your own judgment when reading it. Thank you for the review. It is kind and generous of you to mention my book and to compliment my writing. We have discussed the use of biblical narrative in stories before, and you have disagreed amiably, which I appreciate. I welcome and honor civil discourse over issues such as this one. If you don’t mind, I would like to include a bit more evidence for my side of the disagreement here. Jesus speculated about what would have happened if something that didn’t occur had occurred. This is bolder than anything I have done in my stories in that He took a biblical story and speculated about something that didn’t happen, an idea that contradicts what actually happened. In my stories, I don’t speculate about things that the Bible said didn’t happen. I speculate concerning things the Bible is silent about, and my speculations don’t contradict Scripture. I don’t believe my story events really happened, but I made sure I never contradicted the Bible. We are called to imitate Jesus. Since He speculated about biblical narrative, apparently He honored the practice, so it stands to reason that we, too, are allowed to engage in such speculation. I believe this method to be a valuable teaching tool, and it seems that I am in good company. Again, I appreciate your stand and your manner in expressing it. Reasoned discussion is healthy and productive. I’m going to comment here, even though I haven’t read this book. I did read the first series, though, and unless there have been many changes on the Biblical ‘issues’ mentioned, I think I’m well enough informed to present my opinion. First off, from what I’ve read, Davis has been very good in remaining true to the breathed Word of God, even though he has speculated some of the gaps. At first glance this might set off some alarm bells in my head, but knowing that Davis is a Christian man and as he said in the above comment, ‘I don’t believe my story events really happened’, I am fine with his ideas. Where the danger would come in is if the story had been written by an atheist; someone whose goal was to draw people away from truth and into a falsehood that apparently keeps in step with reality. While I would never engage in any of the sorts of speculation that Davis does, I do agree with him that it is OK and even good that he does. Perhaps the reason why I wouldn’t is a possible fear of ‘slipping up’ or falling short of the pure way that such speculation should be written. I have such a fear (to a very small degree) even with the semi-allegory that I write. If you, Davis, feel comfortable writing the way you do, then more power to you. If God would not have had you writing speculatively like this, he would have placed a similar fear in you. On a final note, I’d like to thank you, Bryan Davis, for writing. You are one of the 5 authors who are my inspiration and who got me going with speculative fiction(fantasy and sci-fi), along with Tolkien, Lewis, Scott Appleton, and Suzanne Collins. If I had more time I would read more of your books than I have, and hopefully that time will come to me soon. Thank you, Andrew for your review, and thank you Mr. Davis, for taking the time to show us why you write the way you do. It is a great blessing. Thank you very much for your comment, Mr. Davis (And thank you also Caleb and Kaitlyn). I really appreciate how you’ve taken the time, now and in the past, to comment on my reviews; that means a lot to me. I guess my position comes down to the fact that fiction is interpreted very differently than straight truth, as the bible. Fiction is written to be entertaining, and to draw the reader in. When we write issues concerning the Bible, we’re taking the facts which happened and embellishing them to create a story which the reader will be drawn in to. Having read all of your books, I can say that you do this very well; your books are gripping. In my eyes, the danger comes when the fiction that we’ve read (because it is entertaining) tends to influence our view of things, even when we know that what we’ve read isn’t true. This is the same reason I don’t generally read End Times novels, as a general rule. To answer your comment about Chorazin and Bethsaida, my response would be that Jesus was calling down judgment on them. This incident, I believe, is the Son of God condemning sinners, not speculating about what might have happened if there had been some poetic license in God’s plan. He was using a Biblical event, namely, the destruction of Tyre and Sidon, to show these other cities their hard-heartedness. Story-wise, the issues that give me trouble are the inclusion of places like Heaven, Hades, and Hell, places which the Bible (I believe) purposely says little to nothing about. 2 Corinthians 12:4 says that “And I know that this man was caught up into paradise–whether in the body or out of the body I do not know, God knows–he heard things that cannot be told, which man may not utter.” The context shows that this is referring to heaven. Is it our place to elaborate on where the Bible falls silent on this issue, and influence readers of our novels? I don’t know the answer for certain, but my convictions are clear, hopefully. I guess this is just something that we’ll have to disagree on; I doubt you’ll stop writing novels like these just because some blogger disagrees with you, and as for me, I still read the novels, and even recommend them, as long as I can caution the reader to use their discretion in reading novels like this. Again, thank you very much for taking the time to comment on my reviews and explain your position in greater detail. You’re welcome around here any time; we don’t get authors often! Yes, it appears that our disagreement will continue, but I’m glad that it is an amiable one. You present yourself well and with a kind spirit. Not to belabor a point, but I assume you and your readers don’t mind having more Scripture to ponder regarding this issue. You mentioned elaborating on the afterlife. Is it our place to do so? Consider the fact that Jesus did exactly that in Luke 16:19-31. I think this was a speculative story designed to teach an important point. Did this event actually happen, or was it a fictional story with a basis in reality? I think it was fictional, but in either case, it points out that Jesus used a story about an afterlife place in order to teach. I think imitating Jesus by doing the same is good and proper. May God bless you and your readers as you strive to follow God in all things. Yesterday, a friend of my younger brother’s lent him ‘Eye of the Oracle’, among other books, to read. Having heard about Bryan Davis’ books from this site and others, I began to read it. I found it to be engaging, but like Andrew, I did not like the way it added to the bible. I cannot speculate on the heaven/hell aspects of his books, as I have only read the first chapter of ‘Eye of the Oracle’, but what I can say is that I was shocked and disappointed at the way he portrayed Ham, one of Noah’s sons. Ham was a real person, and I do not think it is a good thing at all to say something about someone that is not true in order to make a good story. Even though he lived thousands of years ago, it is almost like starting a rumour about him. I may not have minded as much if Ham was a character of Davis’ imagination (although I still did not enjoy the sexual references), but to have him, the son of a man saved because of his devotion to God, portrayed as someone who was committing the same immoral acts God wanted to cleanse the world from, does not make sense. I cannot claim to know the mind of God (‘His ways are higher than our ways’), but I do not believe God would have saved Ham from the flood if he was committing the evil deeds this book claims he does – there would be no point cleansing the world of its evil deeds if a man and woman clinging to the ways of the world were on the boat, being a bad influence to the other passengers. Apart from that, I thought that it was an interesting start to a book (I especially liked the Elohim reference). However, I am not sure I can reccommend it to my brother, because of what it added to the bible. 🙁 I suppose I cannot make any proper speculations at this point, but really shook me and I am not sure whether I should continue reading or not. I’d like to point out that Ham actually did fall away and was cursed; he became the father of Canaan. Read Genesis 9 starting in verse 18. @Imagination: Ditto what Caleb said. From what I understand, Davis speculation about the character of Ham is quite consistent with Scripture. First of all, after the flood, Ham did not merely sin – he sinned grieviously and without remorse. I find it hard to believe that he did something like that just out-of-the-blue. I would be more inclined to believe that the seeds of such wickedness were in his heart for quite awhile beforehand. After all, sin is a slippery slope, not a precipice. This position simply does not hold water (pun completely intended). The Bible never says that Ham was righteous – it says Noah was righteous. Because of that (and God’s grace), both he and his family were saved. Additionally, they were still sinners. They did not arrive at some point of perfection. Noah himself – the great patriarch, “devoted to God” – got drunk and lay uncovered in his tent. Lastly, you keep using “added to the Bible” and “speculation” interchangeably. I don’t think that’s a good thing to do. “Speculation” simply means that Davis is making educated guesses – based in the facts presented – on characters and events. “Added to the Bible” implies that Davis is touting his words as equal to God’s Word; that is to say, divinely-inspired and authoritative. As far as I can see, Davis is doing no such thing. Very good thoughts, guys. Thank you for remaining respectful to each other through this interchange. Having not read this book yet, I have little to add, but I think the bible shows us that Ham had some heart issues which eventually caused him to be cursed by his father. I’d also like to point out that we speculate _all the time._ Just the other day I was speculating about what the world was like before the flood. We wonder about what may have happened in history where it is not recorded for us to know. The only difference is Davis has recorded his musings in a novel. Thanks for the discussion, guys, you all brought up things I hadn’t thought about before. 😀 Also, when re-reading my comment, I noticed that I was being a bit hypocritical – I was bringing down Davis for speculating when I had quite a few speculations myself (oops) – so I apologise for that. I do not think that it is necessarily wrong to speculate, as long as beliefs are not based on speculation. However, speculation over real characters still does not sit well with me. As has been pointed out, Ham did sin, but it doesn’t quite seem right to me that he is portrayed in such a negative light. It’s possible he may have done those things, but there is also a good chance he didn’t. I don’t like it when people make false assumptions about me, and although Ham has been dead for thousands of years, now, I’m not sure he would have enjoyed this being said about him. I suppose what I am worried about is that with these sorts of books, people will take the things Davis is speculating about to be truth, which is something that can so often happen with Christian novels. It is my personal preference to read fictional novels with made up characters and as little speculation as possible, so that I know what is fiction and what is truth. Speculation can, after all, be a dangerous line that, if crossed, can lead to adding to the word of God. However, I do not think that it is a bad thing to read speculative fiction if what is read is questioned and compared against the scriptures. Kaitlyn E. on behalf of ITB. Yes, there are many people who agree with you, Imagination on Paper. For these reasons they do not watch or read fictional stories about Christ (The Nativity, The Passion)or other biblical characters (One Night with the King). And that is okay, I think. I like how good speculation (there is a lot of bad biblical speculative) enhances my view of the Characters and gives me a richer understanding of what could have happened. Not that I believe it is true, but it shows me why someone in the bible could have been motivated to do something. It makes me think more about the implications of the bible. Surprisingly, there is a lot of story we don’t pick up in the biblical stories. Once I looked past what the pages of the bible said, and looked at the implications and cross references in the bible, I had a beautiful, much fuller picture of the story of David and Jonathan. I did not think I would ever buy your books Brian Davies, though I had seen them before and read a little in a book store. They did not really interest me. Now I think I am going to buy them at some point. Hearing you speak for yourself in this setting is better than a choreographed advertisement. Your comment changed my mind.